While Fava beans have set the standard for many Crostini spreads, here the common (and much cheaper and so much easier to deal with) Lima bean stands in. Combined with garden peas and mellowed with a touch of cream, these bright, fresh Lima & Pea Crostini are somewhat unexpected. The exceptional taste is springy, even in the dead of winter. These Lima & Pea Crostini are a breath of fresh air. 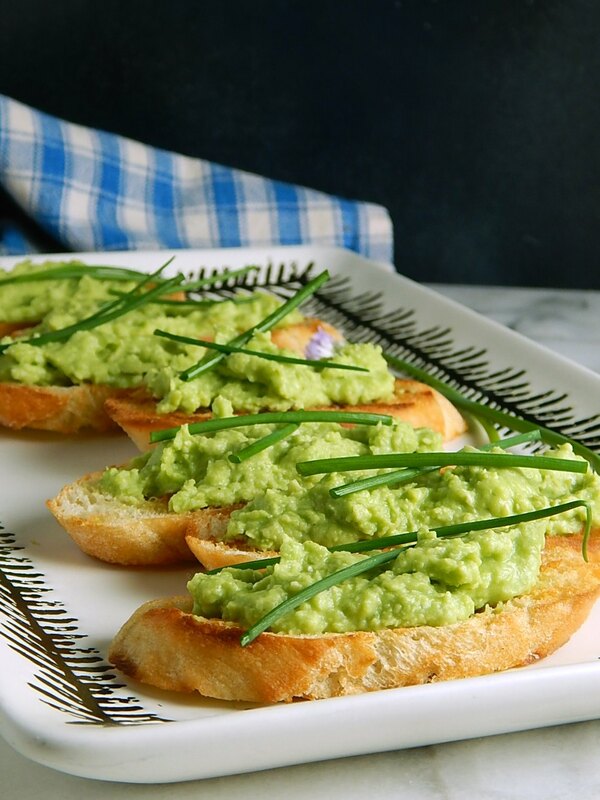 Lima & Pea Crostini would be such a great appetizer for any spring holiday and you couldn’t go wrong grilling your crostini on the deck in the summer, taking that hot, smoky, toasty bread off and slathering it with this creamy spread. These will be gobbled right up as you’re making them! You’ll have people shoving their plates at you, standing around like little birds waiting for the next crostini to be served up! This is one of those recipes that I had a few doubts about, even as I was making it. Could the earthy Lima make a great spread? The answer is yes, yes, yes! This spread really is delectable, just a little substantial but still light, airy and creamy all at the same time. I like it just as the recipe is written, on the plain side, so the delicate flavors shine through, but if you’d like, you can always add a little garlic, mint, rosemary or chive. Tarragon makes an inspired addition. Serve your Lima & Pea Crostini just as is, or fancy it up with a little garnish. Maybe a dollop of Ricotta, a few shavings of Parmesan or other hard cheese of your choice or a drizzle of olive oil. There are no hard and fast rules. I just added a few chives to mine; I thought they would look “sprightly.” In the future I’d chop finely and sprinkle over the crostini; they were a little hard to eat because they all came off in the first bite. The Crostini in the photo are griddled up on my indoor grill; I just brushed them with a little olive oil first. They can be baked or broiled in the oven or tossed on a grill, too. If you’re wanting to make these for a party, double or triple the recipe and make the crostini ahead or buy your crostini already toasted to save time. I used cream because I thought it gave the spread a perfect texture with a rich taste. If you don’t have cream, try a little ricotta, sour cream or maybe some yogurt and just thin with a little water as needed to get the texture just right. It should be smooth and spreadable. There’s nothing to making this recipe. Cook the Lima beans till softened, add in the peas and heat through, then drain. Toss them in either a blender or food processor and blend away. Then add in the rest of the ingredients, by taste. If you’d like to add garlic or any additional herbs, go by taste on them, too. Don’t overpower your spread; the flavor if fresh and delicate. Lima beans and Fava beans have a lot in common, especially when blended up as a spread, although the Lima, I think has a mellower taste. I think it’s funny that the Lima, over the years has earned a bit of a tougher reputation – heck, the Lima bean has been almost vilified, yet the Fava is revered. I gotta say, I do prefer the baby Limas. No one will ever guess this lovely spread comes from a few freezer staples, since I used frozen Limas and frozen peas. A spread like this is also a great way to use up a few leftover vegetables. Just cut the recipe back to size, toast up a few pieces of bread and you’ll have an instant makeover for what might have been a neglected bowl of peas or limas, or maybe even another vegetable languishing in the fridge. The bread probably cost more than the spread in this crostini. You can make your own or just shop the sales. Be versatile; a good French-style baguette is perfect but one of those store bakery “Italian” type loaves probably goes on sale more often and is still pretty good once it’s toasted. Arrange the baguette slices in a single layer on a baking sheet. Brush with olive oil. Bake, turning once halfway through baking, until lightly golden, about 20 minutes. Remove from the oven and set aside. In a small saucepan with a 1/2 cup of water, cook Lima beans until tender, add peas and heat through. Drain. In a food processor or blender, combine the bean pea mixture, 1 tablespoon olive oil, 3 tablespoons of the cream and process until a fairly smooth puree. Add more cream to reach desired consistency. Add the salt, pepper, and herb(s) of your choice if using (see note), pulse to mix, taste and adjust seasonings to your liking. Spread the puree on the baguette slices and arrange on a platter. Garnish as desired, serve immediately. This may be made a day ahead but will thicken a bit upon standing, loosen with a little water, olive oil or cream. Note: Herbs that go well in this recipe are garlic, mint, rosemary, chives or garlic. Add to taste. I’ll be sharing Lima & Pea Crostini at this week’s Fiesta Friday, co-hosted by Caroline @Caroline’s Cooking and Elaine @foodbod. Thanks, guys for hosting all of us! This entry was posted in Click here for Fabulous Food Posts and tagged Appetizer, Bread, Cream, Dried Bean and Peas Leftovers, Italian, Lima Beans, Peas, Spreads and Dips. Bookmark the permalink. It’s a beautiful thing, this spread! 🙂 Thanks!